GUI fixtures are used to attach GUIs to models. GUIs are virtual computer desktops that the player can interact with to unlock doors, call lifts, obtain information, and much more. They are created in the Cafu Engine Gui Editor and use scripts for their implementation and for handling events when interacting with the player. The GUI Fixtures pane lists all GUI fixtures in the model. A single click on a GUI fixture selects it, a double click opens the GUI Fixture Inspector pane as well. Pressing the F2 key or a single-click on an already selected GUI fixture allows you to rename the GUI fixture in place. The “+” button creates a new GUI fixture and adds it to the list. The “-” button deletes the currently selected GUI fixtures. Inspect/Edit opens the Gui Fixture Inspector pane. Rename allows to rename the GUI fixture. Add/create new, like the “+” button, creates a new GUI fixture and adds it to the list. The GUI Fixture Inspector pane shows the details of the currently selected GUI fixture. 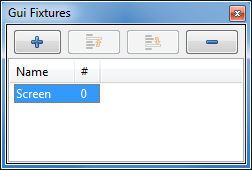 Shows the name of the currently selected GUI fixture. The name can be edited in order to rename the GUI fixture. The origin and the endpoints of the x- and y-axes determine the position and orientation of the GUI. Selecting one of the three GUI fixture menu items will fill in the related numbers in the GUI Fixture Inspector automatically. The Scale values set the relative lengths of the axes. 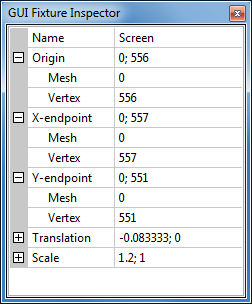 The Translation values move the origin in multiples of the scaled axes.